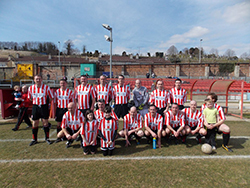 We received a great welcome from all in Derry and the opposition (Derry City Legends team) showed us respect by putting out such a strong team against us, and why wouldn’t they show us respect??? We had a well drilled team who had put in the effort not just to travel to Derry but also to commit to training sessions in the build up to the game. Duncan was kind enough to meet me and a few other lads at the Red Cow but my journey began with disappointment, his BMW only had a tape player (yes folks, a fudging tape player!!!) I had taken the time the day before to burn him a copy of the Easy Rider soundtrack, Steppenwolf denied L instead, we listened to Kevin Nealon and his insights into life and love which lasted from the Red Cow to Newlands Cross but seemed like forever. I’m glad to say Duncan just did the driving; there were no Bare Necessities or any other of his essential songs! Cheers Duncan for the lift and cheers to Bernard, Kevin and Paul for some good banter on the way up. Some travelled up on the Friday. Dave and Garrett started their journey a little later than everybody else and arrived in style, as everyone else was warming up! I heard there were a few nerves building in the management car as Dom, Dave and Kev fine tuned the tactics. 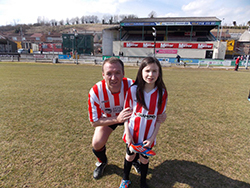 When we arrived at the Brandywell we were warmly greeted by a hot sun and everyone there. The excitement was evident all around and there was a real sense of team bonding and a pride to pull on the jersey!!! Dave’s team talk had us all upbeat about the game until Jamesy pointed out that they had never been beaten (thanks, Jamesy!) The opposition included Felix Healy (ex Northern Ireland player, played in the 1982 World Cup), Eddie McCallon (still playing with Glenavon), Floyd Gilmore (think he was no 10. He could have played in his slippers and dressing gown, he didn’t lose possession once in the 90 minutes! 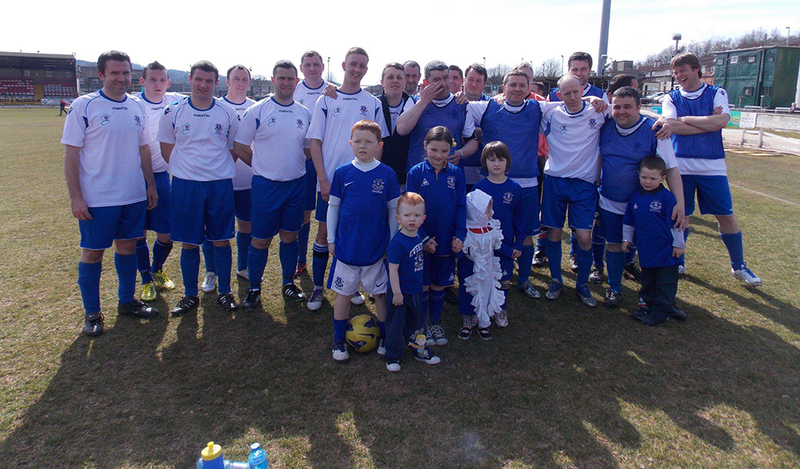 ), Liam Coyle, Jack Kealy, Gary Heeney, Noel Murray, Darren McGreadle and Oxo McLaughlin (Darren Gibson’s uncle). The standard was high! The teams made their way onto the pitch where there was a minute’s applause for Dermot Nealon, a top man and a top Irish Toffee, whose anniversary mass was on that same day. The Irish Toffees side started well and took the lead inside 5 minutes; Jimmy Murphy put his full weight behind an unstoppable shot that gave the keeper no chance. I asked Jimmy about his memories of the goal: “I remember going to close the keeper down, giving him one clear pass to a defender, stuck out my special order size 14 (which are crimson in colour and not red as was suggested by one of our keepers!) which blocked the pass. I put it into the roof of the net. I was delighted to score on my first start for the club”. Thanks Jimmy. We were all on cloud 19 until about the 20th minute mark when Derry City got level. Our midfield runners, Bernard and Dave, covered about 6 miles each in the first half and there was nothing we could do to catch Floyd (in his slippers) as he set up goals for his team mates, ping, pang, wallop, smash, Derry were 5:1 up as the half time whistle went. Paul Moran and Duncan were looking for shorts and shin guards at half time insisting that we would only be 4:1 down if they were at the back. Half time was a blur! We’d felt the unbridled joy of taking the lead courtesy of our Crimson Warrior, had ten minutes where we looked like we were gonna give them a run for their Sterling but then, as their goals went in, the realisation we were a long way from competing at this level. But the enthusiasm stayed the same. Dave and Kevin switched it around a bit and we started the second half well. When their sixth goal went in some heads began to drop but one man whose head certainly didn’t drop was our own Feidh TIM Cahill Kearney! He was running his heart out and got his reward. Feidhlim’s well timed run was matched by a Rojack wonder ball. Feidhlim was not intimidated by the onrushing keeper and after rounding him, calmly passed the ball into the empty net. Cue the biggest cheer of the day! When I asked him for his memories on the goal, he said: “I was itching to get on the pitch and chased a few lost causes before Barry fed me the ball. I saw the chance and was going to take it. I took the ball down, passed the keeper and tapped it into the empty net. I felt like I was dreaming, I just had to do the Tim Cahill celebration. I felt really good after the game. I shook everybody’s hand and had a feeling inside I had made a huge achievement in my life today and winning MOTM made it 10 times better, I really enjoyed myself. One of the best moments of my life and a great weekend” Thanks Feid(TIM)lim, you did us proud. The Derry Legends soon after got the most blatant peno ever! 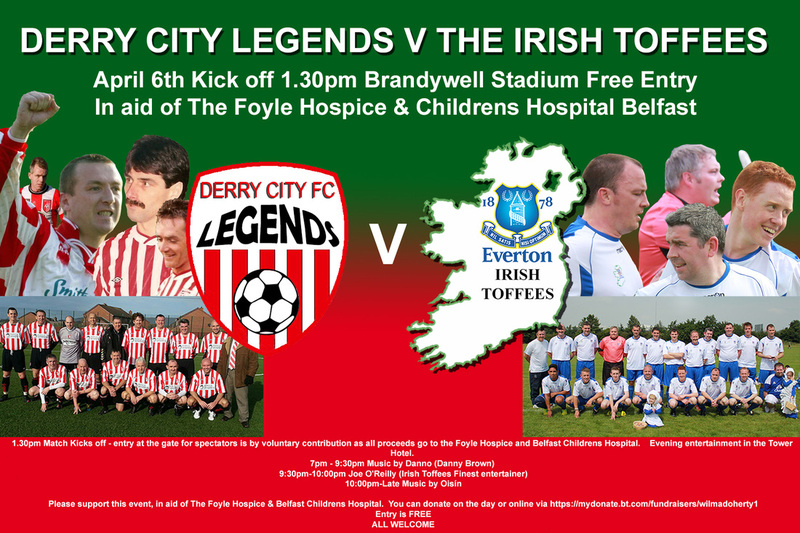 The unhappy Toffees defence tag-teamed the Derry attacker and he hit the ground hard. I think Alan Williamson was nearby… Now just because a team gets awarded a peno against us doesn’t mean we will concede! Our Dom produced a worldie before to keep out Club Everton but these guys were a long way from Seamus Ui Trodd and his band of merry men. The peno went in but Dom remained upbeat enough to pull off some top drawer saves. Dom had a windup going with Floyd Gilmore that he wasn’t going to score and Dom was right, between the post and our first choice keeper’s big frame and limbs, Mr Slippers and Dressing Gown drew a blank. In saying that he was involved in most of the Legends sides goals. The Legends side scored twice more before the end of what was an amazing experience. We all made our way to the pre-booked function room in The Bentley Bar for some refreshments, while some of us were left standing around another hotel and needed to be rescued by Jamesy (thanks again…). A well tasty lasagne or chicken curry made us all feel like winners. Nobody would guess looking at all the smiling faces that we got our arses handed to us on the pitch. No surprises for the IT Man of the Match: Feidhlim Kearney collected the impressive trophy (thanks Joe). Another winner on the day was Aine Murphy, a signed jersey by the Derry City first team was her prize for winning the raffle. Both of these awards were presented by Floyd Gilmore. He had swapped his dressing gown for a smoking jacket but you could still see the slippers! We also had a Grand National Sweep won by Auroras Encore and Dom who collected his cash prize. The race itself was watched on a massive flat screen TV inside a picture frame, very 007esque for that part of Derry. The vegetarian option in the pub was a pint of Harp and a plate of chips. The crowd in the function room began to dwindle down as people headed off, fed and foddered, and Jamesy filled us in on the evening he had planned. It was back to the Tower Hotel, quick shower and down to the bar to see if anyone was about. Paulie Clayton didn’t let me down. There he was, sat on a high stool, nursing his pint of beer like it was the last one on earth. Soon after a good crowd entered the bar, so many in fact that we had to pull 4 or 5 tables together! The Guinness was as tasty as I have ever had it and the craic was 91. The first act in our treble bill of entertainment was Danno Brown (former IT and rumoured to be returning!). He had a great voice and warmed us up with a variety of good tunes. Top man, Danno. Next it was our own Buddy Holly, Joe O’Reilly, who sang like an angel. Hats off, Joe, more Oasis next time, pal. I caught a glance of Donna when Joe was singing and she looked as proud as punch and so she should be. Our final act was a pair of guys from Oisin (Derry’s top trad act). Tommy Quigley and Gearealt O’Mainian played all the traditional Irish hits. Gearealt played the tin whistle like I’d never heard it played before. The place was kicking!!! So much energy, more in fact than was seen from some people on the pitch J The tin whistler must have had a Pied Piper of Hamlyn effect…. because in stomped Gutsey (a local rebel band piss head gate crasher). This guy was banging his feet on the floor, kind of in time to the music. His bag of tinnies carefully placed in the corner. He was getting really into the music and had a smell of wee off him but his entertainment value outweighed the aroma, for a while. Next thing I can recall I was sitting with Ronnie and Reggie Kearney, at around 1 in the morning when a feisty group of women on a hen night came into the bar. That was our cue to end the night. No last man standing award to be claimed although some of the hen group wanted to see Feidhlim’s trophy!!!!! Oh yeah, nearly forgot, a group of us popped out to the local chippie for nourishment and the ropiest kebab in town. The next morning’s brekkie was well received but no cranberry juice! A fry up and freshly cut bread with brie spread on it and a trough of coffee hit the spot. Joe was not to be seen in the AM, Donna informed me that rock stars don’t do breakfast! After check out, Jamesy, Wilma and Jamesy’s mate, Gerry, brought us on a tour of the city walls, showing us who blew up what and when down through the years. Our tour ended at the bus station where we went our separate ways.